The winter storm that the weathermen were calling for wasn’t going to stop Maggy and Stephen from getting married! Fortunately, the weather held off till after the festivities had ended! We had the best time capturing this sweet couples special day. 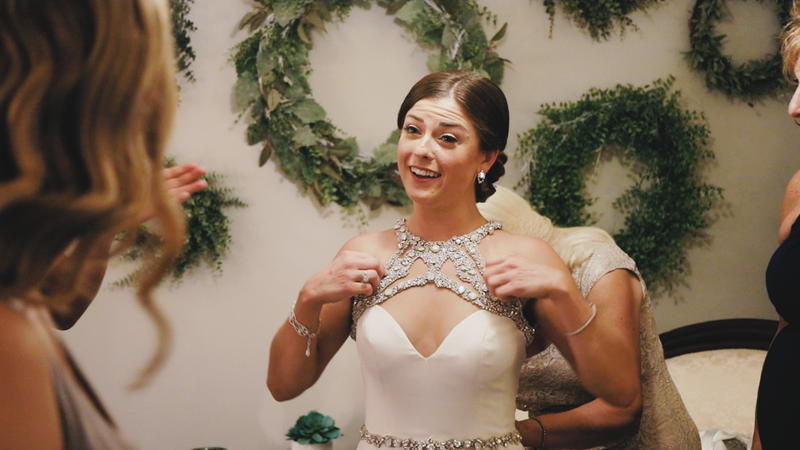 Maggy had thought of every little thing and thanks to their amazing friends and family, they were able to have the most beautiful winter wedding! One of our most favorite moments was the first touch between the Maggy and Stephen…spoiler alert…Maggy even sneaked a peek of Stephen without him even realizing it! Our other favorite moments were the amazing night time shots that we were able to capture! Definitely some of our favorites thus far. We had the best time working with Sarah Griffith Photography and her husband, Daniel! Daniel, strung up some Christmas lights in a small tree outside of the church, all while powering the lights from his Jeep! Mr. and Mrs. Greeson, we wish you two the very best and know that your marriage will be filled with both love and laughter. May God continue to bless you and marriage for years to come! On a slight snowy, December day, Pammy and Grey tied the knot! The festivities began with the sweetest father daughter look between Pammy and her dad. The weather was just right and we were able to do this special moment, as well as the first touch between Pammy and Grey, over at the lovely Pole Barn. During their first touch, the bride and groom to be read from handwritten on acrylic vows to one another. There was the perfect combination of happy tears and laughs during this precious moment. (it was cold) shots of the new Mr. and Mrs. Wordsworth. They say that pictures are worth a thousand words and that a minute of video is worth 1.8 million words! So, sit back and enjoying these 10.2 million words that are worth watching! November was one of the prettiest months to get married this year! 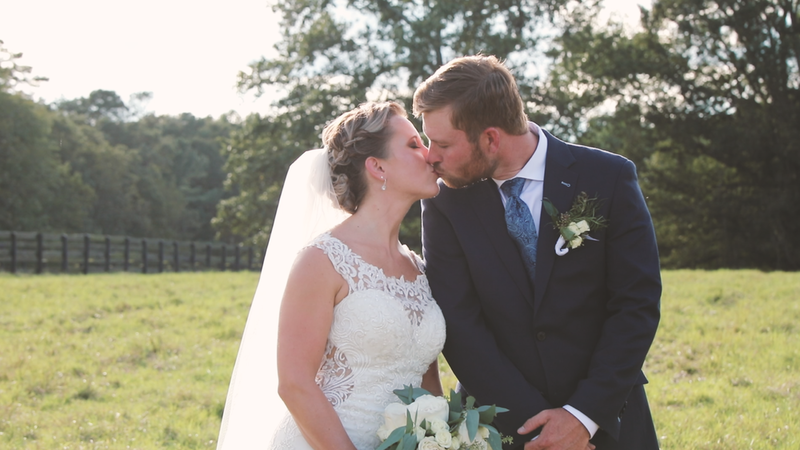 The opening scene of Rebekah & John’s video shows a beautiful drone shot of the gorgeous North Carolina scenery, and another incredible view of Reidsville, NC at the Penrose Park Country Club. We got to hear Rebekah & John express themselves to one another in the letters they wrote to each other, which we used to narrate the film. It seemed like the whole town came out to celebrate Rebekah & John, as the Leaksville United Methodist Church was standing room only! Our favorite part of the day was the reception, full of so much positive energy and dancing. We always love it when wedding guests flock to the dance floor with the bridal party and dance the night away! We are so excited to share the beauty of Rebekah & John’s big day. We wish them a long life together full of laughter and happily ever after! 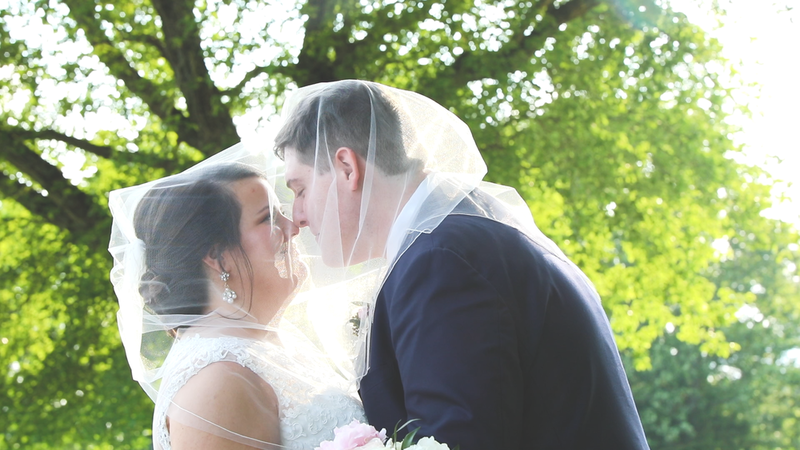 We were so excited to visits the Queen City to film Anne & Chris’ wedding. 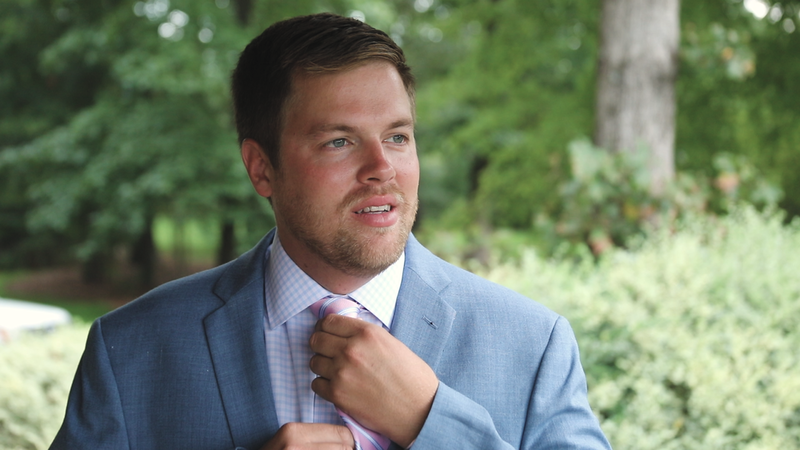 Chris grew up in Greensboro, and Tyler knew his brother, Andrew (the best man) from school. We got to know more about Chris and Anne in their ceremony at the beautiful St. Gabriel Catholic Church in Charlotte, NC. These two have incredible loving families and we loved getting to meet and speak with them! Our favorite moment of this wedding was the entrance into the reception. Chris and Anne showed so much energy as they entered with their bridal party, and continued that into their first dance, which was elegant and very well performed. We also got to capture so beautiful shots around the Uptown Charlotte area, as well as on the balcony of the Mint Museum Uptown overlooking the gorgeous Charlotte skyline. We want to wish the best for these two and we cannot to see what is in store for you both! Congratulations Mr. & Mrs. Ganim! It is always an honor to reconnect with old and new friends! Thanks to Amy & Joe, we were able to do that on their big day. Our very own Tyler and Joe played soccer with one another back in the day and yesterday we were able to capture Joes greatest win yet...becoming Amy’s husband! Our favorite moment was definitely the first look when Joe got to see his beautiful bride to be for the first time in her wedding dress. Between Joe’s reaction and them reading letters to one another, this was such a special moment! These two are some of the kindest and fun people to be around, and we are so happy Amy & Joe chose us to capture their big day. Congratulations you two and thanks for letting us be a part of it all! We had the pleasure of not only getting to know Karla & Josh’s love story before their wedding, but we also got to capture the biggest day of their lives thus far, their wedding day. These two made it clear that God is at the top of their triangle and they intend to chase after Him together. 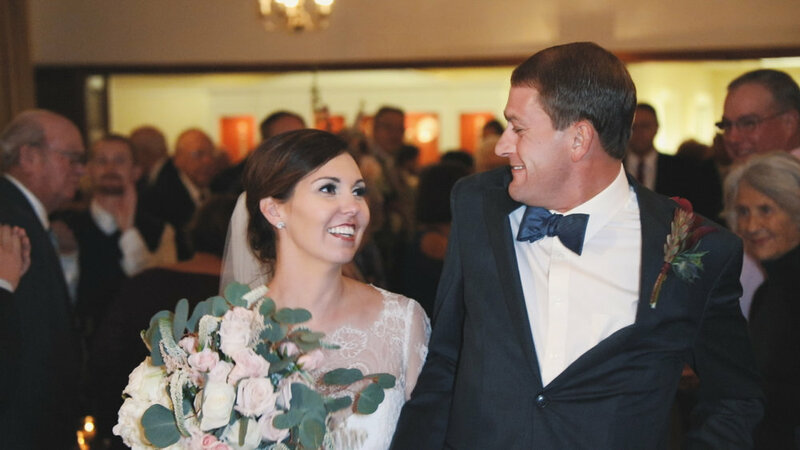 Karla’s vows said “I don’t just want a life that reflects Jesus, I want a marriage that reflects Jesus.” Karla & Josh’s devotion and passion for Christ is something that they both are carrying into their new, loving beginning as one. We had quite a few favorite moments, but one that really stood out to us was the first touch. As Karla approached Josh’s turned back, Josh cracked a smile as he heard her voice. Their fingers locked and they both began praying together. You could tell how much this moment meant to them and how excited they were to say “I do” in their ceremony. We can’t thank these two enough for allowing us to capture such a special love. We wish Karla & Josh the very best and a life full of everlasting love! Alyssa and Shane has been through it all…from swimming with sharks to surviving hurricanes, nothing will tear these two apart. We had so much fun capturing their special day in one of our favorite cities, Raleigh, North Carolina. Haywood Hall is a historic site in downtown and it did not disappoint! The long tree covered, walkway front yard made for the most beautiful ceremony, followed by a night full of dancing in the courtyard. Definitely one of our favorites! We wish you two the very best and a lifetime of happiness! Thank you so much for allowing us to capture your day! On a day when everything seemed to go wrong, these two preserved, as if nothing was going to get in the way of them becoming husband and wife…and nothing did! From the wrong size hitch for a Uhaul, to a broken down car, to some their wedding day would have been ruined, but for Meghan and Patrick, they continued to remember what was most important, that by the end of the day they would become one. We were so thankful that we were able to capture that moment for them. Our absolute favorite part of the entire day was when the bridal party entrance song came on and it was “Every Girl” by the Turnpike Troubadours, one of our favorite bands! We also loved the digging up of the bourbon (also one of our faves) and sharing with each other and friends and family. It is always fun to see what we have in common with our couples! Hurricane Florence had nothing on Jennifer & John as they welcomed the biggest day of their lives with their friends and family. We were fortunate to miss the heavy winds and rain and capture some spectacular shots at the gorgeous Luna's Trail Farm and Event Center in Westfield, NC. Our favorite moment was getting a night time shot at the very end of the night with Cheyenne Kidd Photography! Jennifer and John were troopers and didn't let a few drops of rain stop them from having a great night! We want to wish Jennifer & John a wonderful life together and to thank them SO much for picking us to capture their wedding day! Brandy and Brian tied the knot while surrounded by friends, family, and even their sweet pig, Barbie! Our absolute favorite moment was their first touch. The two shared letters with one another and Brandy gifted a memento from Brian’s parents wedding day so that he had a piece of them on their wedding day. Their story literally brought tears to our eyes. We are so honored and excited to finally share their day with you! We have been fortunate to know Katheryn & Andrew for a while since we filmed his twin brother, Wesley, and his bride, Alison's wedding. We also got to be a part of the beginning of Katheryn & Andrew's wedding planning process when Andrew asked us to film the proposal at The Biltmore! It's so amazing to be a part of the proposal AND the big day. We are so fortunate and happy to have played such a role in Katheryn & Andrew's wedding. Our favorite moment had to be the ceremony. It's always refreshing to see happy tears from the groom as he sees his future wife walking towards him down the aisle. Can't beat it! We want to wish these two an amazing life together and cannot wait for all that is in store. Cheers!! We love going to events at Summerfield Farms during the week. One night, we decided to go up to the market to get some food to cook and had beers on the outside patio. This lovely couple comes up to the market and we immediately started talking. In fact, we talked so long, the market had closed while we were chatting away! Emily & Travis met at the hotel Emily worked at in New York. Travis was there for business training and Emily just so happened to catch his eye. Travis would write love letters to Emily and pass them to her each day. The training ended up lasting a few weeks, so it seemed like this wasn't a coincidence; this was meant to be! Our favorite moment of Emily & Travis' wedding was simply the fact that they were so patient, calm and cool, and appreciative of us. It rained almost the whole day that we spent with Emily & Travis and it didn't seem to phase them at all. The stuck it out because they knew their wedding day is only the beginning of the real prize, which is being each other's life partner. 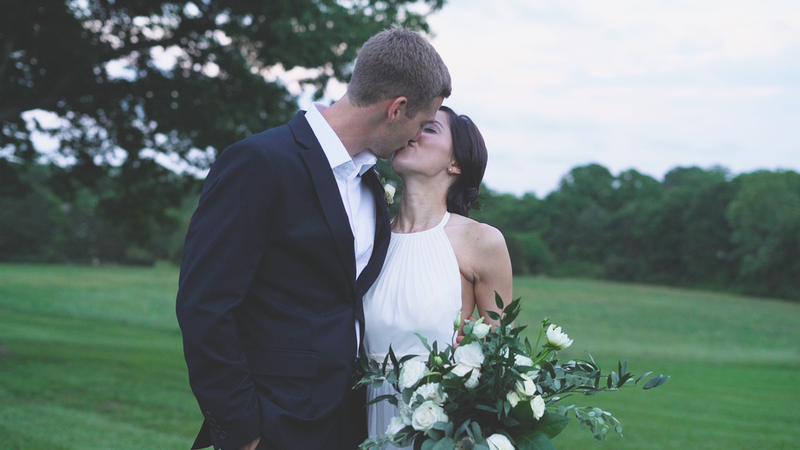 We are so excited for Emily & Travis and are so glad we met them that night at Summerfield Farms. We look forward to catching up with them and watching them create a beautiful life together! On the very first day of September, Kelley & Kevin became one at the always gorgeous Highgrove Estate in Fuquay-Varina, NC. Our favorite moment had to be during the ceremony when right after the officiant announced Kelley & Kevin husband and wife, a long, rolling sound of thunder continued in the distance. It was such a cool moment! They rolled that energy into the reception where they danced the night away with friends and family. We are really fortunate to be able to have such amazing couples! These two were nothing but appreciative of our work, which makes it so much easier for us to do our job. We wish Kelley & Kevin a long and happy life together with nothing but smiles and happiness! We were so excited for Britney & Matt’s big day! Our very own Tyler grew up playing soccer with Matt, so it was special to us to be able to capture this moment for these two amazing people. We got to meet up with Britney & Matt before the wedding to capture their Love Story and learn more about how they met and fell in love. Without a doubt, these two lawyers are in love and are both #LegallyMillisor! One of our favorite moments was getting to capture Matt and Britney’s reaction to reading the letters they wrote for one another. It was so sweet to see the emotions and happy tears/feels! We also captured them reading their own letters aloud and were able to use that to help narrate their video. We think it set the tone, and are so excited for you all to tell us what you think! Congratulations Britney & Matt! We are beyond grateful that you chose us to capture your love story and your wedding day, and we look forward to running into your guys again, whether it be at Taco Mama or anywhere else around the Triad! We were so lucky to have been able to capture yet another chapter in the amazing story of Cori & Benjamin this past weekend as they became Mr. & Mrs. Smith. 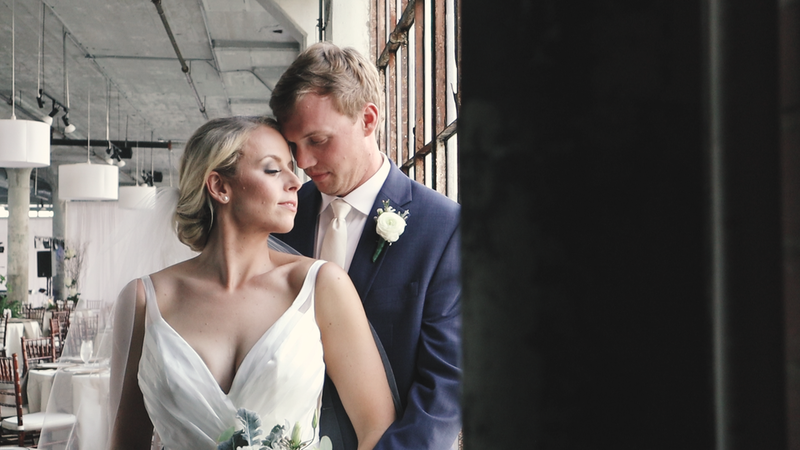 The ceremony space was gorgeous with light from both sides of the industrial windows flooding into a room of people witnessing love being united as one. One of our favorite shots was of Cori getting ready in front of a window in the bridal quarters. Something about how the light and industrial look of the venue converged into the perfect shot...sometimes it's the little things! We enjoyed getting to hear about how Cori & Benjamin's friends and family love and support them. It's always special to hear about how amazing our couples are and how much of an impact they have on the most important people in their lives. These two were fantastic to work with and made our job easy. We wish Cori & Benjamin a happy life together and hope they are blessed with all the graces of the Lord! 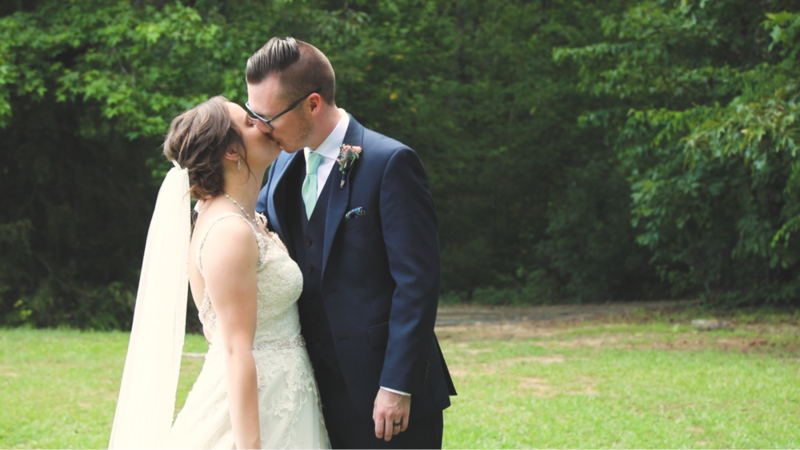 Ashley & James have known each other since they were kids and the pages turned to the next chapter of their life on July 1st when they said "I do" in front of friends and family at Victory Mountain Camp in Sofia, NC. You can immediately tell how perfect they are for each other. The way that they laugh together. The way that they look at each other. It's so special to us that we were able to capture this on camera! Our favorite moment was during the toasts. Ashley's Dad gave a wonderful speech, one in which he didn't intend to choke up, but did (twice!). At the end of the toast, Ashley & James didn't have any glasses to toasts, so they simply faked it, laughed it off, and danced the rest of the day away with friends and family. That really makes us smile, so we had to include it in their video! We are thankful to have gotten to know The Quesinberry family and be a part of Brooke AND Ashley's big days. They were such a joy to work with and we can't thank them enough!! We got to see love unite last May when filming Brooke & Tyler's wedding. 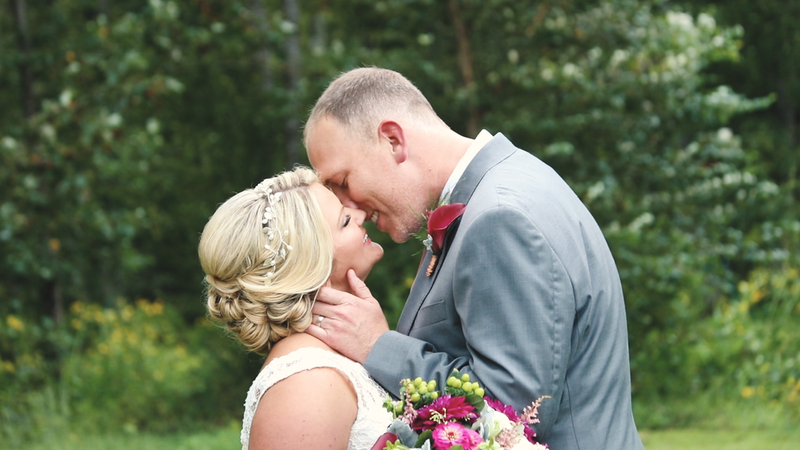 Brooke and Tyler are high school sweethearts and their love and committment to each other brought them to The Longhouse in Stokesdale, NC where they said their vows in front of their friends and family. Though the weather moved the ceremony inside, it still didn't stop these two from uniting as one. One of our favorite moments was shooting with Misty Felde and her amazing team. We are always pretty giddy when it comes to taking sunset photos with the bride and groom, but this time it was special. We were able to capture some beautiful night shots that made us scream with excitement when editing their highlight video. This is the kind of stuff that we live for!! We can't thank the Quesinberry and Acord families enough for their hospitality and kindness towards us. It truly makes what we do worth it when there is so much appreciation for what we do. Congratulations Brooke & Tyler, and enjoy your highlight video for years to come! If you are a fan of One Tree Hill and you know Lizzie and Jason, then you know that their story is pretty much like the classic Haley & Nathan Scott story. Lizzie was the beautiful and smart girl, while Jason was the good-looking, goofball, accident-prone "jock" that he still is today! Like Haley and Nathan in One Tree Hill, Jason fell for Lizzie early on, however, it took Lizzie a while to see that there was just something about Jason and she could see herself spending the rest of her life with him. So, low and behold, after several attempts Jason finally got his Haley (Lizzie) and we were lucky enough to have been able to capture their beautiful day and witness these two precious souls become one! On a day that the weathermen were calling for a 40% chance of rain, God let the sun shine down on Lizzie and Jason at the ever so lovely little tree at Summerfield Farms. Surrounded by their closest friends and family, Lizzie and Jason became husband and wife! We are excited to share their story with you and so happy that they each found their Haley and Nathan. In the words of Lucas Scott, "They give their hearts to each other, unconditionally. And, that's what true love really is. It's not this fairytale life that never knows pain, but it's two souls facing it together and diminishing it with unconditional love." Heres to The Davises! On a beautiful day in May, friends and family gathered at the always stunning Summerfield Farms to witness Hayley & Andrew become one in marriage. The rain held off, allowing for a beautiful ceremony to take place in the grassy space of a wooded area. Being around these two was special. Their love is visible both on the inside and out and is centered around their commitment to their faith. It is truly remarkable to be able to work with such caring, funny, and all around good people. It certainly makes our job easier and even more grateful to be able to do what we love to do! Our favorite moment had to be the digging up of the bourbon. Our friends who got married did the same thing and we always thought this was a cool concept. It's something we actually want to do at our wedding next January! This was the first digging up of the bourbon that we actually captured on camera and we will certainly never forget it. We look forward to shooting more in the future! Congratulations, Hayley & Andrew. We wish you nothing but hapiness and can't wait to see the amazing things in store for you two!